This is a very popular supplement for natural allergy relief from the seasons. The “nasal and sinus health” capsules claim to be fast-acting, non-drowsy for sinus support. Basically, they are saying that this product is good for seasonal allergies and environmental allergies. It’s full of natural herbs and flowers, which is great, but here’s my honest review of Rootology Breathe Free Nasal and Sinus Health. Treats conditions: Seasonal allergies to pollen, environmental allergies to mold, irritants, pollution, chemicals, smoke, dust and dander. Treats symptoms: Sinus problems, congestion, runny nose, sneezing, itchy eyes, watery eyes, cough, headache, trouble breathing, excess mucus production. This supplement claims that it can solve our allergy problems! Great news! One simple natural supplement will treat your allergy symptoms throughout the day and give you no discomfort from side effects. Also, since these are all herbal ingredients, there are no long-term health risks or chronic inflammation involved like there are with OTC antihistamine drugs. Well, that’s not entirely true. And if you’ve been playing this natural health game for a while, you’d know that there are no magical supplements that will cure your problems. In fact, most supplements are actually a placebo. I think that the majority of natural or herbal supplements are just a placebo, or they may work so mildly that you may not even notice an improvement. This supplement has got a great purpose, but if you suffer from moderate to severe seasonal allergies, this herbal product will not really help you enough. Flat out. How Does this Nasal and Sinus Health Supplement Work? According to Rootology, our nasal and sinus health is very fragile and quickly deteriorates with age. (This makes me think that they are marketing towards older people.) Whether it be seasonal pollen, dust, mold, chemicals or anything that’s in the air, this blend will supposedly treat the annoying symptoms. Alrighty then… so we have all these fancy flowers in our allergy supplement instead of one or a few for some reason. Upon researching each ingredient I can tell you that 11 of them have no medical research supporting their incorporation in health supplements. This means that 11 of those things aren’t doing anything for you. They are most likely just pretty names to put on your product to make you feel good about what you are taking. On top of that, we aren’t entirely sure that most of these herbs are safe. Just because they are herbs doesn’t mean that there aren’t any health risks to taking them. You should always be skeptical for science and health. The only ingredients that have some scientific research backing its effectiveness is licorice root and schizandra fruit. Research suggests that these ingredients can stimulate the immune and nervous systems in some ways for health benefit. The directions say that for adults, you should take a minimum of 2 daily to “immediately” support nasal, sinus, and eye health. These pill capsules are also very big. Alright, so with that, let’s see how many capsules are actually in the bottle: 40. So, the minimum amount of days that this supplement will last is 20. I think that is really ridiculous and unnecessarily expensive. The cheapest price that I could find was on Amazon for 17 dollars plus shipping for a 40 count bottle. If you think about it, that is much more expensive than over-the-counter antihistamines. I purchased this natural allergy supplement on Amazon after looking for a good price because the dosage is incredibly high. The lowest I could find was $17 and I originally thought this was very high of a price. And that was a correct judgment because it was about a dollar a day to take this supplement when you do the math. On the first few days, which were early summer days when grass pollen kills me, I took 2 capsules. I’ll just be honest and say that I noticed absolutely no difference in my well-being or allergy symptoms. After about a week, I took 4 capsules and I had noticed that my seasonal allergy symptoms were well-managed for about an hour or two… but that was about it. Don’t get me wrong, though, those two hours felt amazing. And then when my supply was running low, one day I took 6 capsules and I felt very wired for about 3 hours. It was kind of an intense trip that clearly did something, but my sinuses felt like rubber and I still felt groggy. Then afterward, I felt drained of energy and motivation. I’d much rather have taken an OTC antihistamine because it’d be more effective and make me feel better. On top of that, this natural allergy supplement was very expensive. I wouldn’t try it again, basically. What Natural Allergy Supplement Works Effectively? So my allergies are very bad. I have food allergies to all legumes and shellfish, while having oral allergy syndrome to many raw fruits and vegetables. I’m allergic to the spring, summer, and fall and many types of mold and dust. And all of these symptoms are annoying and embarrassing while keeping me from performing at my full potential. Through the years, I’ve discovered that human bodies are unique due to genetics and nutrition is specific to each person. For example, coffee may be healthy for one person but unhealthy for another. Therefore, I could conclude that these symptoms that I experience are just an indication that my body has an imperfect lifestyle that needs healthy change. I’ve found that eliminating bad habits (processed sugar and salt, drugs, alcohol, simple carbs, overeating, not exercising) has helped me tremendously more than any other supplement could. The first step to treating the root causes of your symptoms is proper nutrition. I’ve discovered that the majority of people living (anywhere from 80-90%) suffer from at least one type of mineral deficiency. This is a new health concern because fertile soil 100 years ago was full of nutrients. Now, since industries have taken over, their inorganic practices have almost stripped the recycled nutrients from the soils completely. Sulfur: Likely for high rates of inappropriate allergic response and food intolerances. Silica: Brittle hair and nails, acne, etc. That being said, if you suffer from allergies, I highly recommend you try a bioavailable source of sulfur in supplement form. The key to that is “bioavailable” meaning it is in organic form for your body to absorb naturally. It is highly likely that the exponential increase in allergies among our children is due to the lack of sulfur present in our fertile soils, which trickles down into our health over the years and into our children. The absolute best source of sulfur is through crystalized MSM. MSM is found in all plants and animals because it is the bioavailable compound term for sulfur that is used by our cells. If we consume it unheated, then we can absorb this compound into our bloodstream within minutes. I have been taking MSM for two-and-a-half years now and I can say that this is the most helpful supplement for my allergies (and health symptoms in general). Along with a healthy lifestyle, my allergies to food and the seasons have diminished drastically. If I take a minuscule, inexpensive scoop of MSM in my drink in the morning, my symptoms really disappear and I feel great. It works by eliminating allergic chemicals produced by your body, supplementing organic sulfur into your cells, which was likely needed for a long time. This is how human bodies are supposed to work naturally. Unfortunately, when we suffer from nutrient deficiencies for so long, we just get used to the symptoms that bring us down. MSM has a half-life of 12 hours, so the allergy relief will be for that long. I don’t even sneeze now, it feels great. Along with that, my oral allergy syndrome has diminished to almost nonexistent and my shellfish allergy seems to be healing as well. Crystal MSM has really been doing wonders for my body. Provides steady cellular energy for motivation throughout the day. 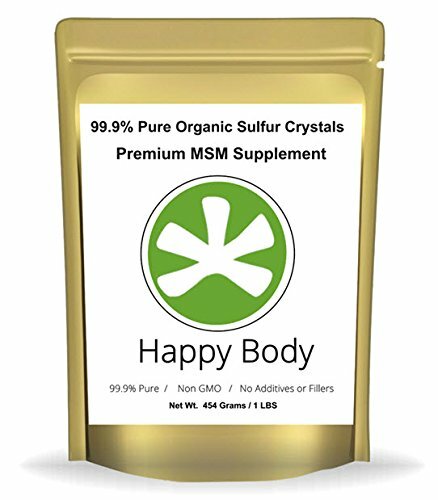 Click here for the least expensive, most well-reviewed MSM crystals. I order this inexpensive and well-researched brand of MSM bi-monthly and I will until I die. A few of you guys recommended it to me because it’s the least expensive and most well-reviewed. I recommend all types of allergy-sufferers give this a try and tell me how it worked for you. 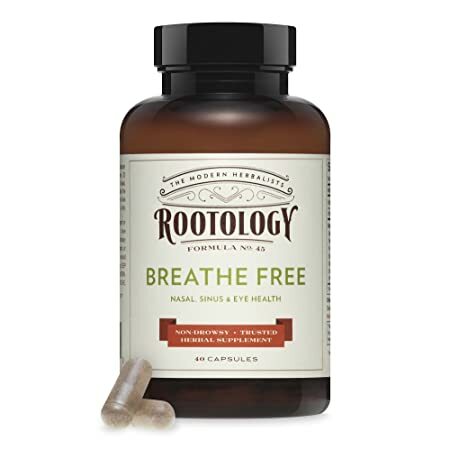 I am always here for you, so if you have a question or something to add to my Rootology Breathe Free review, please leave me a comment below! Rootology Breath Free works great for me. It opens and dries my sinuses, and works within 20 minutes. The drying action is not as harsh as that of traditional OTC sinus products. I have not noticed any side effects. No drowsiness! I first became familiar with this product while working for a natural products broker (I sold Rootology, along with hundreds of other products). We provided health products stores with two-tablet foil sample packs they could give to patients who came in with colds or sinus issues. Stores that sold lots of this product would give these sample tablets to ailing customers and if they could keep the customer in the store shopping for awhile the product worked for most people within 20 minutes. If the product worked, the customer typically bought a bottle. I no longer work for the broker, but still use Rootology. I personally think many “natural” supplements are of questionable value, however this one works for me. Last month I drove 30 minutes to a health food store in a neighboring town just to purchase Rootology when I came down with a cold. As one of your readers, I would not be afraid to try Rootology. Thanks for your honest input about Rootology breathe free capsules. They can definitely show promise for providing allergy relief naturally for people who suffer from mild allergies. However, moderate to severe allergies generally pose a problem that controls peoples’ every day lives, which leads them to this site. I would recommend allergy sufferers give it a try as well. I have been looking for a good rootology breathe free review on the internet, but I mostly just got results for the brand’s actual website. I didn’t think that was really reliable. Thanks a lot. Yeah I thought the same thing. There are so many allergy-sufferers that take rootology breathe free every day and I just really think that they are less expensive and more effective natural methods for relief.